The 1930s were a terrific decade for horror. With blockbuster hits such as Dracula, Frankenstein, The Mummy and countless lesser known gems littering the way through to the 40s. 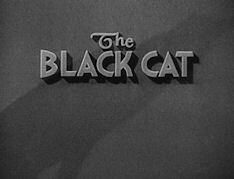 One of these lesser known films is indeed Edgar G. Ulmer’s 1934 classic, The Black Cat. 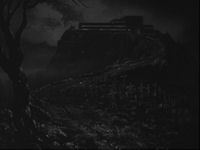 Incredibly loosely based on Edgar Allan Poe’s short story of the same name, the film features both Dracula and Frankenstein’s Monster themselves, Bela Lugosi and Boris Karloff in their first feature film pairing. But, are these two masters of horror a match made in Heaven? 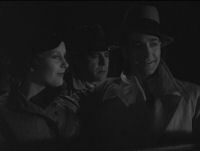 The film opens with two honeymooners, Peter (David Manners) and Joan (Jacqueline Wells) Alison traveling on a train when they get an unexpected guest. Their cart has been accidentally booked twice and being the nice folks they are, they invite the newly introduced Dr. Vitus Werdegast (Bela Lugosi) to travel along with them rather then him staying outside in the hallway. Dr. Werdegast tells the story of him being in World War I and having spent time as a prisoner of war for the last fifteen years. He has finally been released and has to meet up with someone from his past. After arriving at their stop, Peter and Joan are invited to travel with Dr. Werdegast as their destinations are in very close proximity to one another. The driver of the car tells the tale of where they’re traveling to and how it was the site of a battle in the war where ten thousand men perished when suddenly the road gives way and the car goes out of control taking the life of the driver. The trio along with some servants make way to a safe place, the home of one of the world’s greatest architects, Hjalmar Poelzig (Boris Karloff). The man with whom Dr. Werdegast has a little catching up to do. When alone at the home, Hjalmar is almost immediately confronted by Dr. Werdegast regarding their sordid past. Hjalmar sold Dr. Werdegast and his infantry out to the Russians, allowing him to get out safely, but leaving everyone else to die. Of course, Hjalmar seemingly has a motive for his decision, he told Dr. Werdegast’s wife, Karen and his child that he had died in battle and took them off to America where she would become his wife. Or, so Dr. Werdegast thinks. He plots to wait until the time is right to end Hjalmar’s time on earth. Hjalmar develops an interest for Joan and it turns out he wants her to be the main attraction during the dark of the moon for a nice little satanic ritual. 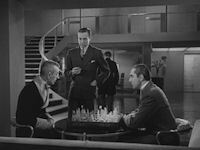 In a very surreal scene, Dr. Werdegast and Hjalmer play a game of chess for the rights to Joan. If Hjalmer wins, she will be present at the ceremony, if Werdegast wins, she is to go safely. The outcome bears on the plot as it thwarts Dr. Werdegast’s plan for revenge and adds the fact that he must only not look out for his own motives, but try to save the life of the girl as well. What happens next and in between would be a shame to reveal, but rest assured there’s enough twists and turns regarding the Karloff and Lugosi’s characters accompanied with rich atmosphere that will keep you on the edge of your seat the entire way. 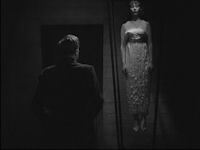 The film’s short 65 minute running time really lets the movie fly at a furious pace and certainly helps it become a minor classic of the horror genre. 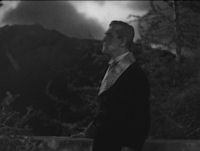 The scenes that Karloff and Lugosi share are absolutely amazing and it gives you chills to see the horror legends share the same screen and feed off one another. Along the way are some great lines (“… are we not both the living dead?”) and great direction, not to mention the aforementioned chess scene, a truly monumental moment in horror history. Other than the chess scene, there is one other that really sticks out. The scene where Dr. Werdegast is being told the story of how thousands of men had perished in the war on the very spot they were traveling on (and later, Hjalmer would build his house on the same spot – talk about evil) by the driver is of significant importance. Bela Lugosi was in World War I and his look in the scene grabs your heart, he experienced such things first hand and you can’t help but pause for a moment and think about how personal such words must have been to him. Bela was a great actor, but the look on his face was too good for even him, it was a look of complete sincerity and reflection and without a doubt something he’d thought about dozens of times before, while Joan and Peter listen on for entertainment. As stated earlier, the film is very loosely based on Poe’s story, but for the most part it was added into the film for publicity. Only a few scenes have Dr. Werdegast afraid of a black cat and neither is too important to the story. It’s also pretty odd to see Lugosi play the role of a hero rather than the villain, although there are many dark traits to his personality, mainly his motive for revenge. 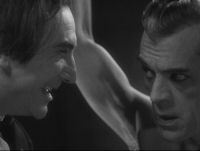 But, all in all he is the good guy and he plays the role to perfection, and Karloff is as sinister as ever. Another tidbit of interest is the movie actually features small amounts of blood, something greatly appreciated in such an old film. 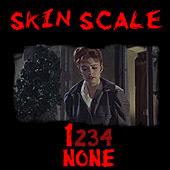 The DVD has a beautiful transfer for such a film of its age, and it is packaged along with four other movies featuring Karloff and Lugosi for a very affordable price. A true classic that’s not been remembered over time as much as it should be, The Black Cat is definitely a winner. Checkmate. Buy it!